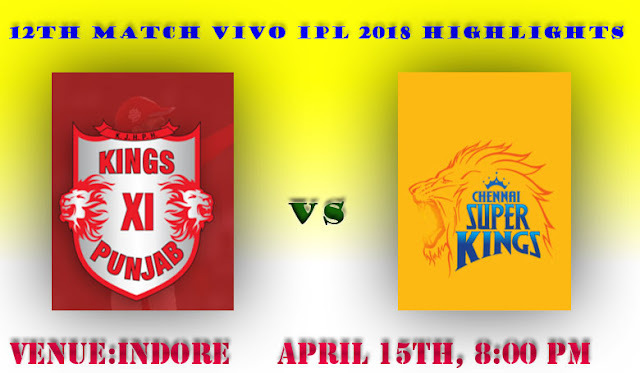 Kings XI Punjab Win by 4 runs in a Thrilling IPL encounter on Chennai Super Kings,Dhoni's unbeaten 79 runts Kings XI Punjab (KXIP) edged Chennai Super Kings (CSK) by four runs in a thrilling Indian Premier League (IPL) clash in Mohali on Sunday. Harbhajan strikes immediately after the break, KL Rahul hits a full toss straight to Dwayne Bravo at covers. He completes a smart catch and Rahul departs for 37 off just 22 balls. KXIP are 96/1 after 8 overs. they Reached 100 in just 8.4 overs. Shane Watson got Break through, He got the Wicket of Chris Gayle, who is looking dangerously.Gayle departs for 63 and KXIP are 127/2. Murali Vijay Playing first for CSK in this season along with Shane Watson will start the chase for Chennai Super Kings.CSK are 39/2 after 4.2 overs. Ravichandran Ashwin strikes as soon as he comes into the attack here, it is also the big one of Sam Billings who was the hero in the previous game, he departs for 9 off 8 balls and CSK are 56/3 after 6.4 overs. CSK need 76 from 30 balls. It's 122/4 after 15 overs. That is a heartbreak for MSD and CSK. The skipper single-handedly took his side so close to the victory, but falls short of just 4 runs in the end. Dhoni ends with 79 from 44 balls. CSK end on 193/5 in 20 overs.This is the first loss for CSK in this year's IPL.